Today I am sharing with you my new Summer card I created with beautiful CottageCutz Petite Summer Collections 2014 of dies. So cute images and lots of fun work with this collection. I used just one Flipflops die cut for this card. First, I created sand background using brown cardstock and craft sponges for water and edges. Next, I cut flip-flops out couple times, sponge the edges and glued to sand background. Added sentiment on card and decorate flipflops with rhinestone. OHHHHH, summer, summer, summer..... Love the summer time. This is my favorite period in the year. 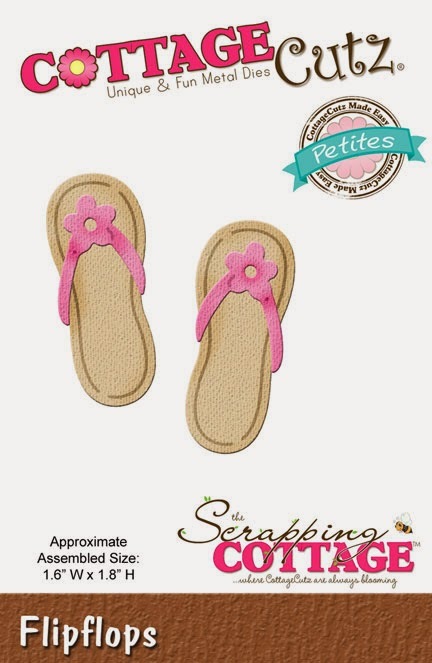 Absolutely LOVE your card and all the details surrounding the flip flops, too cute! This is so creative and cute. Love how you did the sand and flip flops. Imaginative and lovely. Baby Welcome to the World!